Nicolas Winding Refn's works are far from family friendly, but it's this years The Neon Demon that takes his lust for stylish for violence and twisted imagery to new heights. Starring Elle Fanning as aspiring fashion model Jesse, the film explores a darker side to an industry that appears glamourous on the surface - but toys with the mind and grossly objectifies the human body when you search within. Jesse's journey leads her to numerous others in the fashion trade, including makeup artist Ruby (Jena Malone), and a downward path of decadence with naught but tragic results. Sounds like an interesting narrative - if only Refn could convey it properly. When it comes to the visuals of The Neon Demon, the majority of the film is stylistic and extremely unique, boasting some suitably dark imagery and a number of bizarre yet imaginative scenes unlike anything seen in previous films of the genre. However, at times, these images aren't supported with narrative context - meaning their existence in the film isn't truly justified and thus their presence often quite confusing and random. Pacing is a common concern as the film tends to move at a strange, sluggish pace - this can suit the tone of certain scenes, and it's evident this is an intentional trait at times, but it doesn't detract from the fact that the film too often becomes a tiresome bore. These two flaws coincide when scenes relying on prolonged moments of glorified images and lighting techniques drag out, only to then shift to other scenes that race along a brutal pace; thus completely cocking up all chances at developing characters consistently. The acting is generally solid, with Fanning providing a fitting deadpan performance, even if she sometimes lacks emotional engagement - perhaps this is often more down to lacklustre writing than her own talent, as the character is so thinly written for a central protagonist that her potentially powerful narrative development is squandered in favour of, as established, visual thrills. When it comes to supporting characters, the only real memorable one (used loosely) is Jena Malone as Ruby, but her eventual transition in the film's final act, without trying to spoil, is somewhat abrupt and not entirely believable. Others include Bella Heathcote and Abbey Lee Kershaw as competing fashion models who also clash with Jesse, and whilst their characters also have emotional potential, it is often wasted due to their minimal screentime and Refn's inability to balance them with the other cast members. Keanu Reeves, whilst incapable of not providing any charm, is also thrown aside with a fairly meaningless character in the form of Hank, a rough motel owner, who has no real purpose and could easily be removed with minimal impact on the script - never a good thing. 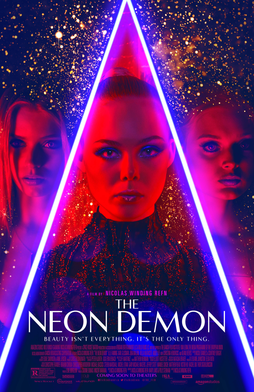 The Neon Demon isn't light on shock factor either - whilst it's clearly for adults based on it's age ratings, even they can't reveal just how disturbing the film gets as it nears it's climax, and it's certainly going to severely freak out even the most bold viewers. It's just a shame that Refn focused more on the aforementioned colours and highlights in his cinematography and imagery as well as this shock factor than he did with creating a well structured narrative. Clumsy pacing, vague storytelling, and forgettable characters (many of whom appear briefly and then vanish) result in a film that has no principle focus and so only stands out because of how well it occasionally seduces and shocks the audience.